This year I had the pleasure to perform some baking demos at the Lichfield food festival. I love these types of events as I get to share my passion for baking with a live audience and often get to meet up with other bakers and chefs. At the festival I was overjoyed to be on on the same day as Val Stones. She was a previous contestant on the Great British Bake Off and I am a big fan. When I met her it was like we had known each other for years. 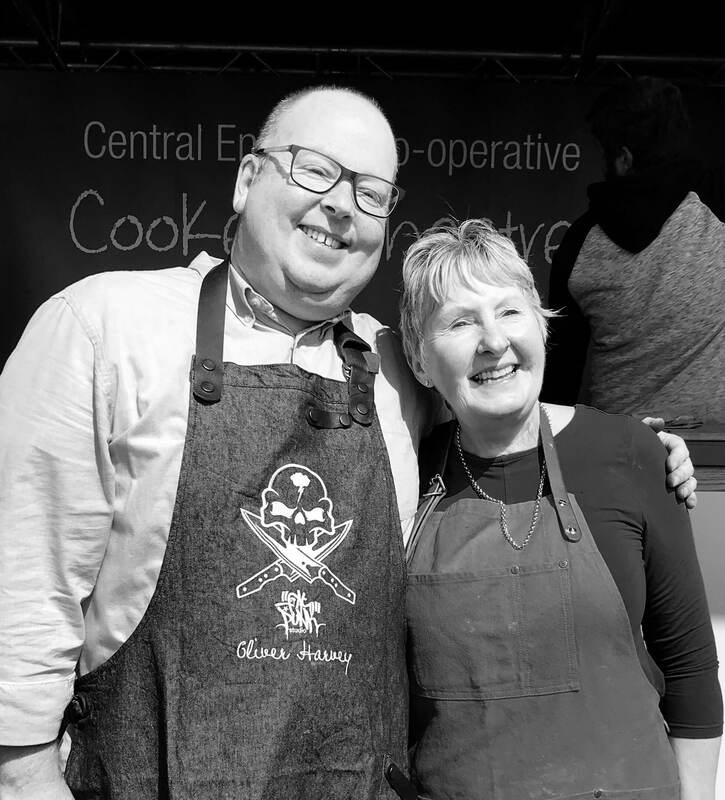 She is such a warm and lovely person and we had a great time chatting about our experiences and helping each other out when we were demoing and clearing up. The organiser, knowing I loved a challenge, gave me a call about a week before the show and mentioned one of the sponsors would love it if I could incorporate beetroot into one of my bakes. I had wanted to play around with a beetroot brownie recipe I had seen on Waitrows website, the allotment was awash with them and so my chocolate beetroot brownie was born. Rich, gooey, earthy sweet goodness. 1. Pre heat the oven to 180 ̊C, 160 ̊C Fan. 2. Grease and line a 20cm x 30cm baking tin with baking parchment. 4. Bring to the boil and cook until soft and tender – about 1 hour. 5. Drain in a sieve, pop into a food processor and blitz to a purée. Keep 1 tbsp purée for the icing. 6. Melt the chocolate with the butter in a large heatproof bowl over a pan of simmering water. 7. Leave to cool for about 10 minutes and whisk in the eggs, granulated sugar, vanilla, espresso, beetroot purée and salt into the chocolate. 8. Add the flour and cocoa, fold everything in until just combined. 9. Pour into the tin and bake for 35-40 minutes, until it looks cooked and shiny on top and cracks have just started to appear. 10. Cool completely in the tin then put in the fridge for a couple of hours or overnight before serving. 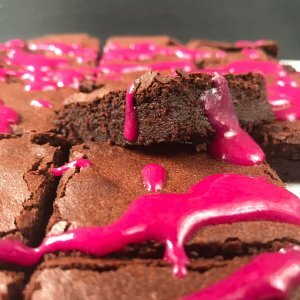 Delicious rich chocolate and beetroot brownies. Pre heat the oven to 180 ̊C, 160 ̊C Fan. Grease and line a 20cm x 30cm baking tin with baking parchment. Bring to the boil and cook until soft and tender – about 1 hour. Drain in a sieve, pop into a food processor and blitz to a purée. Keep 1 tbsp purée for the icing. Melt the chocolate with the butter in a large heatproof bowl over a pan of simmering water. Leave to cool for about 10 minutes and whisk in the eggs, granulated sugar, vanilla, espresso, beetroot purée and salt into the chocolate. Add the flour and cocoa, fold everything in until just combined. Pour into the tin and bake for 35-40 minutes, until it looks cooked and shiny on top and cracks have just started to appear. Cool completely in the tin then put in the fridge for a couple of hours or overnight before serving.